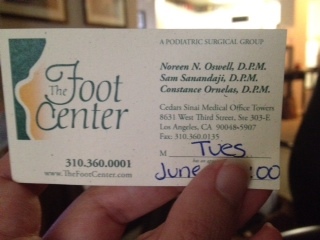 Before I forget, I just wanted to make a note that it was Dr. Noreen Oswell who helped me when I had the deep puncture wood in my foot–she’s awesome! After she took the wood out of my toe, she said couldn’t believe how normal my toe looked “I honestly didn’t think there was anything in there”, but then when she cut into it she found a 1/2 inch deep piece of wood, angled straight towards my bone. Dr. Oswell was *awesome* to keep investigating just based on my complaints of being in pain–too many doctors don’t investigate any further because I always look so normal! I’m **so** super grateful! As much as I am still struggling fighting off the complications, who knows what would have happened if that wood had stayed in my toe any longer! This entry was posted in General Life, General Medical Industry. Bookmark the permalink.